The eagle … I mean dog has landed! After much trauma and indifferent service from an international pet relocation service, we have finally been reunited with Sherrie, my Dad’s dog. Poor thing has been on three flights – first from Kansas City, Missouri to Dulles, Washington, from Dulles to Amsterdam, then from Amsterdam to Cape Town and at last she is home with us. She arrived just after midnight last night and was happy to see us again with lots of licks and happy tail wagging. (It seems we were more traumatised by the endless delays and complications than she was). The introduction to Dexter was a bit hairy for us – Dexter in his usual, larger than life, very exuberant way, tried to welcome Sherrie with much charging around and excitement which must have been very intimidating for a small dog. She held her own though and after they settled down (many hours later) things returned to some sort of normal here. Now Hercules … well that’s another story. Hercules is less than impressed. After being an “only child cat” for 6 years we got Dexter. He’s finally accepted Dexter as being part of his life and we bring him another one of these strange barking animals. (At least this one is one fifth of the size of the last one!) So we still have to get Hercules and Sherrie accepting each other … that could take awhile. What I wanted to share today is Sherrie’s enthusiasm for her new garden (or “yard” as an American dog would call it ). She had a tiny, postage stamp yard at her home in the USA and ours is huge in comparison. She is loving it … she’s been exploring it all day and I got a few nice shots of her surveying the scene. She’s not done any digging (yet! ), loves sniffing the plants and seems happiest outside in the open where she can run around and explore. I know my Dad would have been thrilled to see how quickly she made herself at home and how happy she seems when she explores her new space. What have we here? My very own lawn! I even have a new bed and new toys! 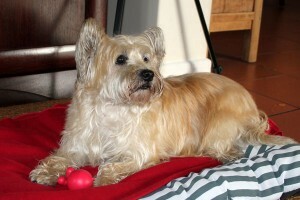 Sherrie is a Cairn Terrier. My Dad rescued her via a wonderful organisation called the Colonel Potter Cairn Rescue Network. Due to his age, one of the promises he made to them was that she would be well taken care of in the event that he passed on before she did. My daughter in turn promised my Father that she would bring Sherrie back to South Africa if that should occur. Sherrie was rescued by the Colonel Potter Network from a puppy mill and she then found herself with my Dad. He adored this little dog … she was his constant companion for the last 2 years. Sherrie is now six years old. 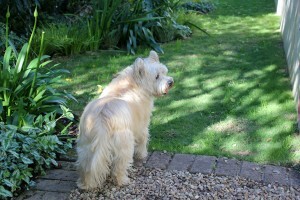 Cairn Terriers apparently live 12 to 14 years so we have many years of enjoying Sherrie ahead of us. 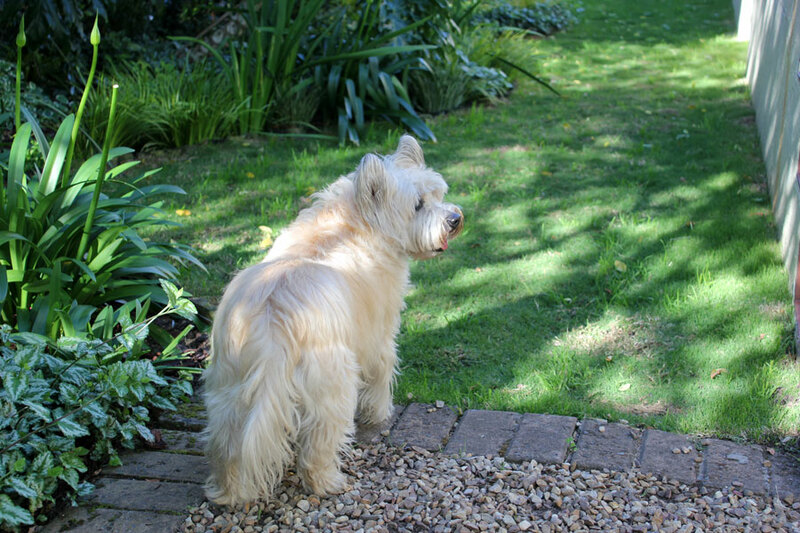 Thank you for reading … I know this is slightly off topic, but our pets are a great part of my garden as I love nothing more than their company when I potter around in it. Cairn Terrier information (from Wikipedia). 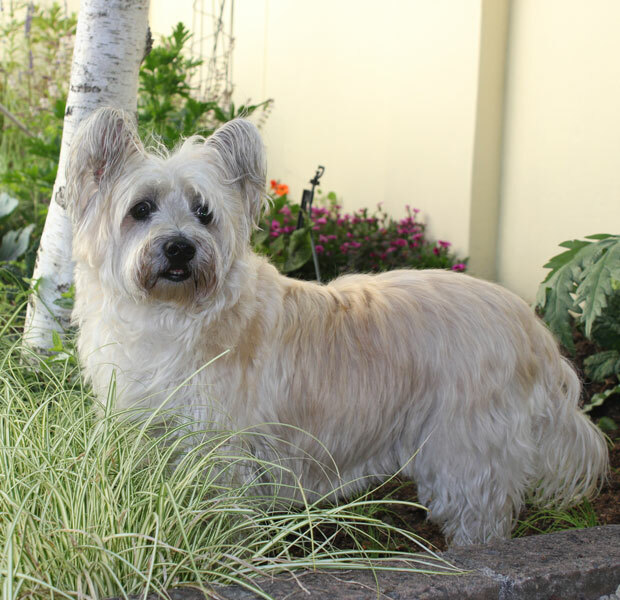 The Cairn Terrier is one of the oldest terrier breeds, originating in the Scottish Highlands and recognized as one of Scotland’s earliest working dogs. It is used for hunting and burrowing prey among the cairns. Although the breed had existed long before, the name Cairn Terrier was a compromise suggestion after the breed was originally brought to official shows in the United Kingdom in 1909 under the name Short-haired Skye terriers. 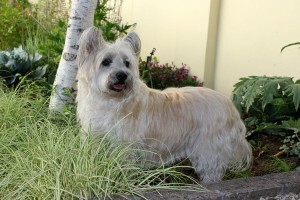 This name was not acceptable to The Kennel Club due to opposition from Skye Terrier breeders, and the name Cairn Terrier was suggested as an alternative. They are usually left-pawed, which has been shown in dogs to correlate to superior performance in tasks related to scent. Cairn Terriers are ratters. In Scotland they would search the cairns (man-made pile of stones) for rats and other rodents. Thus if one is kept as a household pet it will do the job of a cat, specifically catching and killing mice, rabbits, and squirrels – I hope this might help sort out my “Mole Problem”. Referred to as a “big dog trapped in a small dog’s body” Cairn Terriers are adventurous, intelligent, strong, loyal, and tough–not a delicate lapdog. 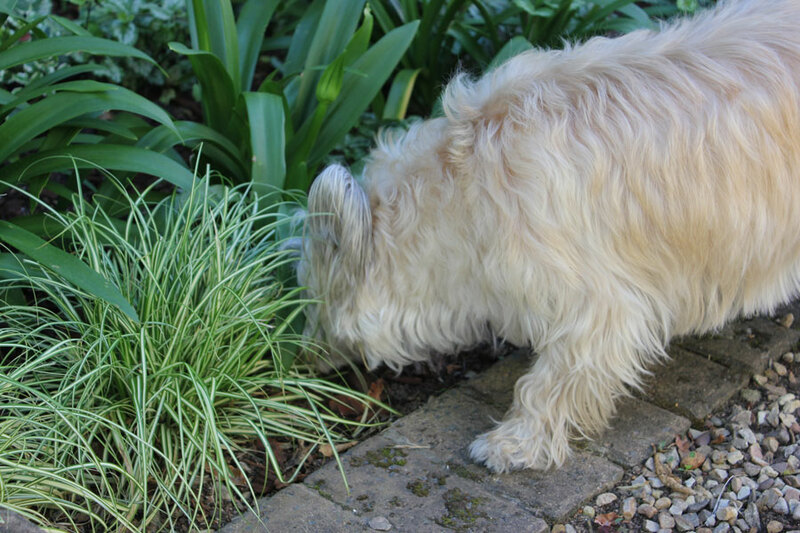 Like most terriers, they love to dig after real or imagined prey. They are vermin hunters. Cairns have potential aggression toward other animals with strong chasing instincts but will co-exist with them more readily than some other terriers. I am catching up on all your posts. How bittersweet and lovely. Animals and people are so resilient, even when we don’t want to be. Bless you both. Now that I can see her, I wonder if she is the same as Wind and the Wellies peedie (little in Orcadian) dog. She says dug when she’s being Orcadian. Orkney Islands. Garden helpers have a very important slice of garden blog real estate! what a lovely thing to do! It looks as though she wont take long to settle in. Oh Chris! She is SOOOOO CUTE!! What lovely photos of her and she seems so happy in the garden. I have a feeling she will bring you lots of joy! What a sweet companion. She is beautiful! I am sure is very happy to be reunited with your family. I know that the two of you have a long adventure ahead of you, and, with your common bond, that adventure can only lead to bigger and better things Nothing but good wishes to you all.